Here at Stone Oak Orthodontics, our team believes in the simple power of gratitude. What better time of the year to express our gratitude than Thanksgiving. Thanksgiving brings to mind different thoughts to different people. To most, it brings visions of a family Thanksgiving feast with roast turkey, mashed potatoes, dressing with yummy gravy, cranberries, squash, and of course…pumpkin pie! To a student away at school, it may mean coming home to be with those they miss and possibly some much needed down time from the daily rigors of school and studying. Then again for others…are you ready for some football… a day off from work… or a long weekend? 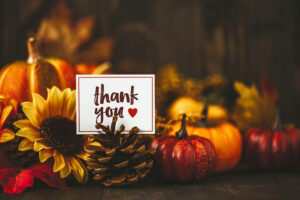 Here are a few quotes about gratitude we hope will set the tone for your Thanksgiving this year…. With all the turmoil going on in the world today and especially here in the US, let’s take a moment this year to express our gratitude to those close to us. Keep gratitude in your heart and say a thank you for your life, your friends, your family and your blessings. And above all, be kind and remember compassion this Thanksgiving. From everyone here at Stone Oak Orthodontics, we are extremely grateful to be given the opportunity to offer all of our patients and their families the highest level of orthodontic care we can provide and will never take for granted the trust you have placed in our hands. We wish everyone a very Happy Thanksgiving! We hope it is filled with joy, love, and gratitude.